This is, in my books, the best time of the year to indulge in baking and baked treats. Wait, I err. Second best time of the year, by just a smidge, next to Christmas. When deathly masks and skeletal structures make way for pine cones, mistletoe, and glitter. Loads of glitter. And tinsel. With explosions of cracker red everywhere. When temperatures drop and carols (albeit, at times, so mashed up in the name of “remix” that I cringe) reclaim airtime. That time of the year when fragrant whiffs of Mace and Nutmeg permeate the air, right alongside Cinnamon and, insert big happy smile here, Pumpkin. In order for you to fully appreciate my ardent love for that ribbed cultivar of the squash, you must first recall that hailing from Borneo, the only pumpkins we had were those on jackets of storybooks, cooking magazine covers and the telly. Growing up, we would voraciously devour tales of jack-o-lanterns; of the ill-fated Ichabod Crane and shattered pumpkins; of fairy godmothers and mistreated beautiful young women. That’s all we had. 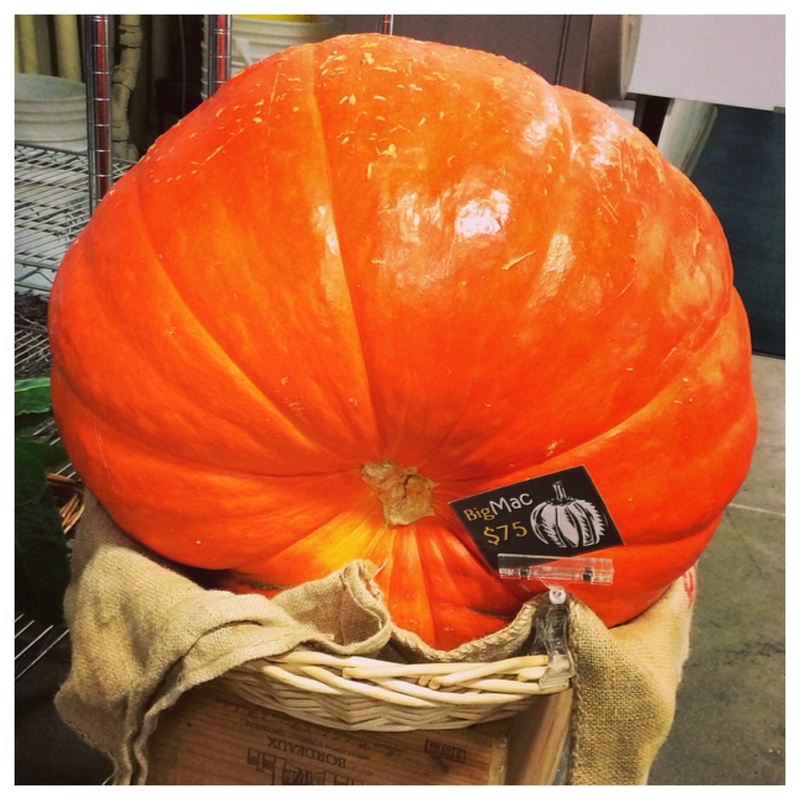 Many years on, I was in Wichita, Kansas, when I saw my very first real pumpkin. Here I was, staring at Cinderella’s ride. No, an entire fleet of rides, in every size and shade of deep yellow to orange. I was enchanted. However, it wasn’t until much later (8 years down the road, I believe) that I would savour a slice of pumpkin pie. That, my friends, marked the beginning of our oh so sweet, if somewhat seasonal, love affair. Big Mac here measures just about 50″ in circumference. Therefore, in the harmless spirit of culinary debauchery (sprinkled with touches of nostalgia, naturally), I baked Pumpkin Pillow Cookies today. Poofy to look at. Springy to the touch. Soft on the inside. And delightfully crunchy on sides and bottom. Just perfect. Sharing my recipe now so you too can indulge in a bite (or four) of deliciousness. Preheat oven to 350 degrees F. Place parchment paper on baking sheets. 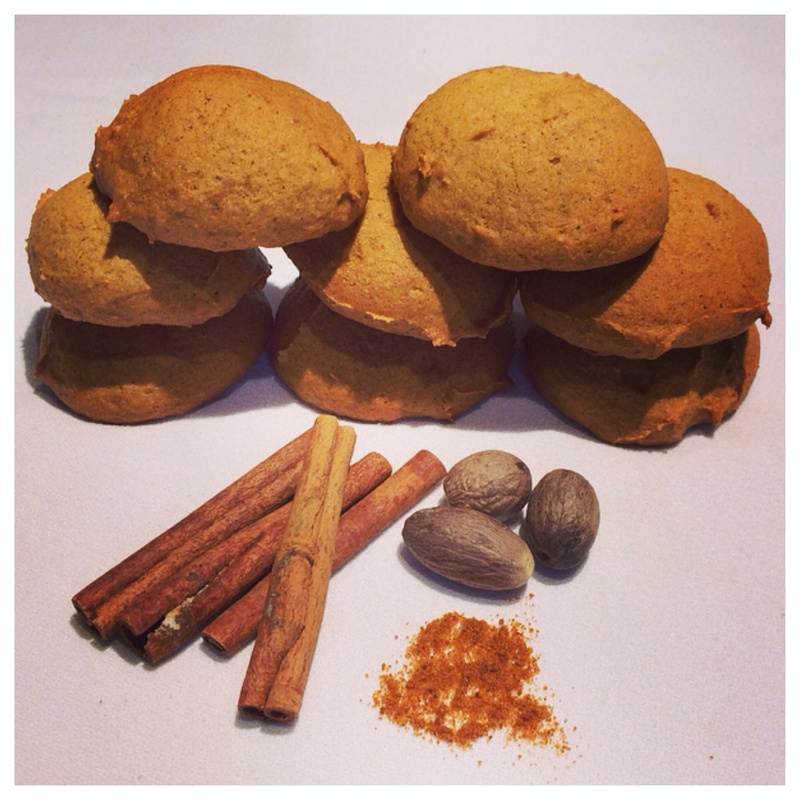 Combine flour, baking soda, baking powder, cinnamon, nutmeg, mace and salt in a medium bowl. 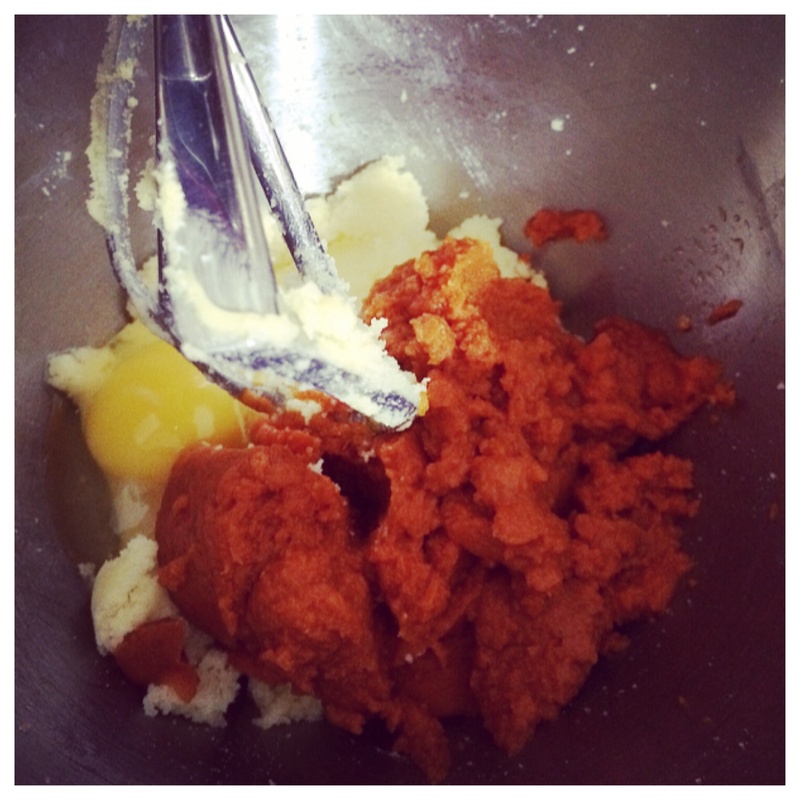 Beat granulated sugar and butter in mixer bowl until well blended. 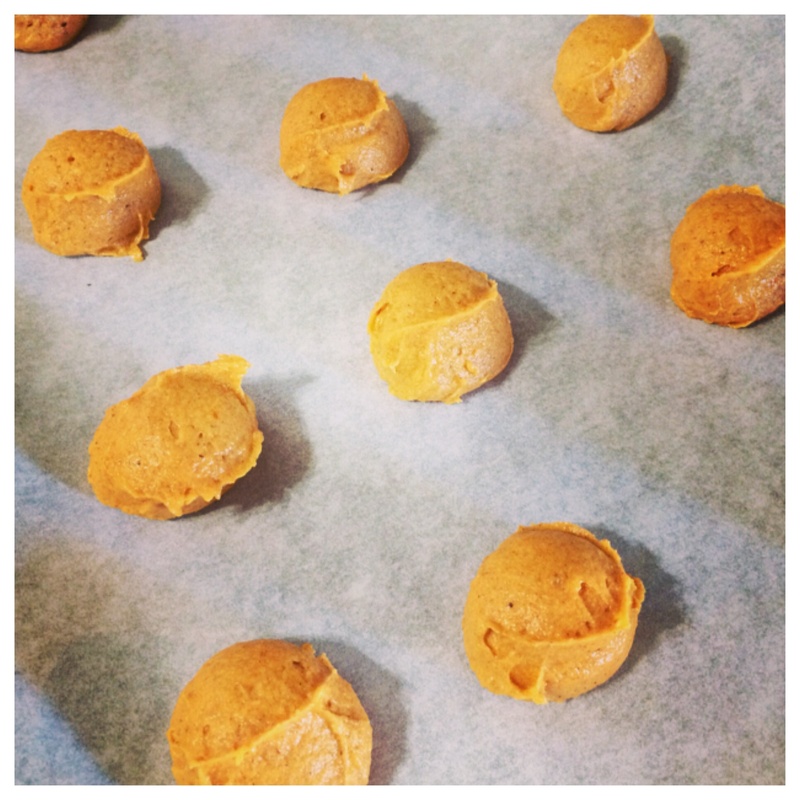 Beat in pumpkin puree, egg and vanilla extract until smooth. Gradually add flour mixture. Drop by rounded tablespoon (I use my medium-sized ice cream scoop). 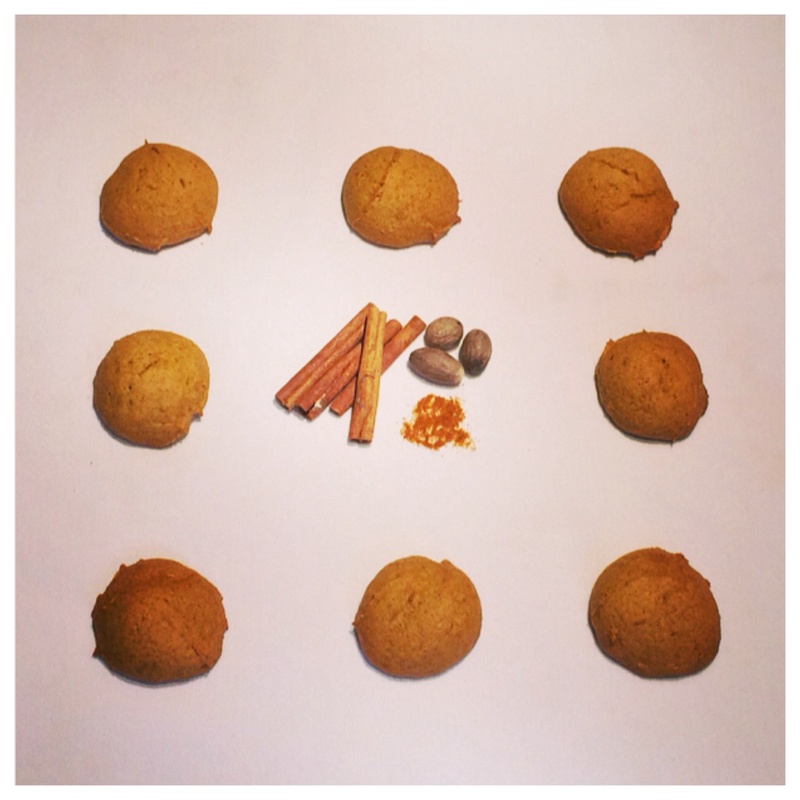 Be sure to leave a gap of around 2″ all around between the cookies as they will puff up and spread a bit. Bake for between 17 to 18 minutes or until edges are firm. Cool on baking sheets for about 5 minutes as the bottoms of the cookies stick when they’re fresh out of the oven. Remove to wire racks to cool completely. These pictures were taken of a subsequent batch wherein I used an entire can of pumpkin puree. The extra puree thickened the batter and, as such, the cookies did not expand to 3″ in diameter, as they did the first time around 🙂 no matter. They were, I quote a friend who nicked quite a number, godly. My ego has been officially stroked. Did you know the word pumpkin originates from the word pepon, which is Greek for “large melon”, something round and large? The French adapted this word to pompon, which the British then changed to pumpion and, later, American colonists changed that to the word that is used today, “pumpkin”. Also, I had a question about the blog–do you think you could drop a note at my email?